Do you need to hire a Minibus? Edinburgh Van Rental can provide minibus rental in Edinburgh, the Lothians and beyond at fantastic rates. Whatever the reason you need to rent a minibus or large people carrier and no matter the size of your group we have a vehicle solution to suit your requirements. Our diverse fleet of minibuses include 9 seaters, 13 seaters, 15 seaters and 17 seaters. Driving a minibus in Edinburgh, and indeed the UK, requires an extra category on your driving licence (D1). If you have any questions about whether you can drive one of our minibuses, please contact us and we'll be happy to help. 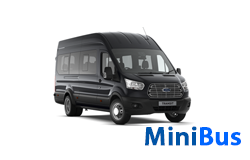 Ready to hire a minibus? Call us on 0131 207 0035, use the form on our contact page or Book Online! Here's a list of specifications for our minibuses. Please note that due to the variety of different models in our minibus fleet the information above is based on averages. If you have a specific request regarding vehicle model or seating arrangements please contact us and we'll do our best to meet your needs. Do you need a minibus on a weekly or monthly basis?